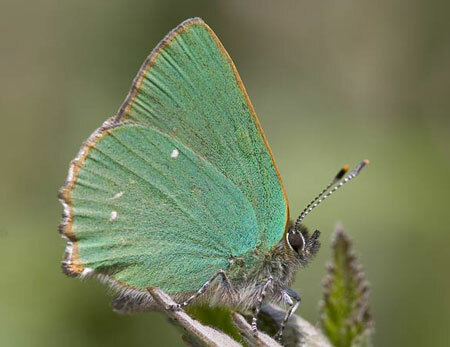 Special features: This is the only butterfly to have completely green coloured scales on the undersides of its wings. The upper surfaces of the wings are brown. 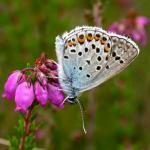 The male has a light grey coloured scent patch at the front of each forewing on the upper surface. This is the only noticeable difference between the two sexes. The bright green caterpillars grow to approximately 15mm. They spend the winter in the chrysalis stage, often underground inside ant nests. The chrysalis is able to communicate with the ants via a sound organ which makes a series of clicking sounds audible to the human ear. Distribution: Found widely throughout much of the UK but in small numbers. Months seen: April to July. Food: The caterpillars feed on a wide variety of plants including; bramble, broom, bilberries, gorse, bird's-foot trefoil and vetch.